Starbucks new Midnight Mint Mocha Frappuccino gets a gold star!!! If you haven’t gotten to try the newer Midnight Mint Mocha Blended Creme Frappuccino at Starbucks yet, I would highly recommend it. It was one of my favorite frappuccinos awhile back when Starbucks had their 1/2 off Frappuccino Happy Hour. I definitely give it a gold star, and it is one of my new favorites. I also am a big fan of the new Smores creme Frappuccino. If you are looking for a description to make your mouth water, here it is: “We’ve paired the dynamic duo of dark cocoa and refreshing mint with milk and ice. Next we infuse the blended chocolatey beverage with cooling mint sugar crystals, cut in a layer of whipped cream, then top it with more whipped cream and a dusting of dark cocoa” (description courtesy of https://www.starbucks.com). Since it is only at Starbucks for a limited time, if you want to try it, it may be good to get it before it is gone!!! 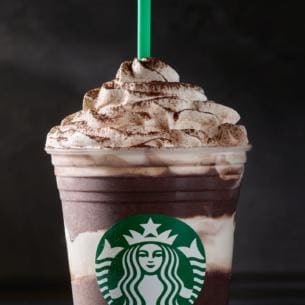 This entry was posted in Starbucks, Starbucks seasonal drinks, Uncategorized and tagged Starbucks, Starbucks Midnight Mint Mocha Creme Based Frappuccino.